The "World Peace Association" appears to be based in Jenkins, Minnesota. I assume the red-white-brown-yellow-black is to represent the "five races of mankind". I found this flags on a card at http://www.dicklightle.com/card.asp?ID=33997. I ran across the Brotherhood Flag card you put on the internet. My mother was the Foreign Correspondent for the World Peace Association, appointed 30 June 1957. The flag you depicted on the card was dedicated at Odessa, New York in May of 1958. It then became part of the exhibit for the association at the Brussels World's Fair. I was the flags standard bearer at the dedication. association applied for registration of the flag and changed flag design. and registered it with the Secretary of State Office in Minnesota and the flag became official on 5 November 1939. The description of that flag as written on the certificate is as follows. "The Brotherhood Flag consists of five (5) horizontal stripes of equal width. The first or top strip is red the second stripe is white, the third stripe is brown, the fourth strip is yellow and the fifth or bottom stripe is black. Each stripe represents one of the five different groups of the human race." The flag prior to the final one I just described consists, by dimensions, of two squares of equal size. The staff end (one square) is composed of a blue field upon which fifty white five-pointed stars have been arranged in such manner as to form a large five-pointed star, in the center of which a white dove in full flight, with green olive twig in beak. The blue star-studded half of the flag has long been a symbol representative of the heavens and of man's belief in a Divine Creator and of his hope for a life hereafter. The dove with olive twig in beak has likewise long been recognized throughout the world as man's most outstanding emblem of peace. The fly end of the flag (also one square) has the 5 horizontal stripes. Due to costs of the flag's manufacture this flag was discontinued and the flag with just the 5 horizontal stripes became the associations official flag. 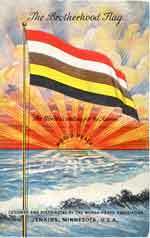 This flag was discontinued due to the cost of manufacture as was the 1915 version. In 1954 Edith Wynner from NYC wrote a book on World Federal Government, published by Fedonal Press, Afton NY, and printed in Holland. It had big sales and was reprinted 3 times. About a month ago I obtained the book from our library system. So it's still around. Anyway, following WWII and the creation of the United Nations and into the early 60's the World Peace Assn and Brotherhood Flag flourished. During the 1960's and the minority revolution in the US much of the money donated to the WPA went to the African American causes, NAACP etc. The idea of the UN changing its charter to include World Government seems to have faded a great deal. In searching for info on my postcard, your FOTW site has the most info on this group of any that I googled!!! Since your info did not include a pix of the a dove/globe flag, I thought you might want to add it to your site. I also included the back of the postcard which has a double verse phrase that might be interest as well. Since I've been working on peace flags and updating those pages on FOTW lately, I figured I'd go ahead and respond to this E-mail of Rob's from April 2011. 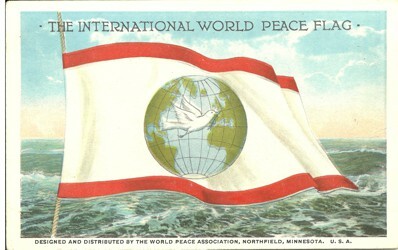 I giffed the flag of the International World Peace Association to FOTW standard, based on the scanned postcard that was sent to us three years ago. 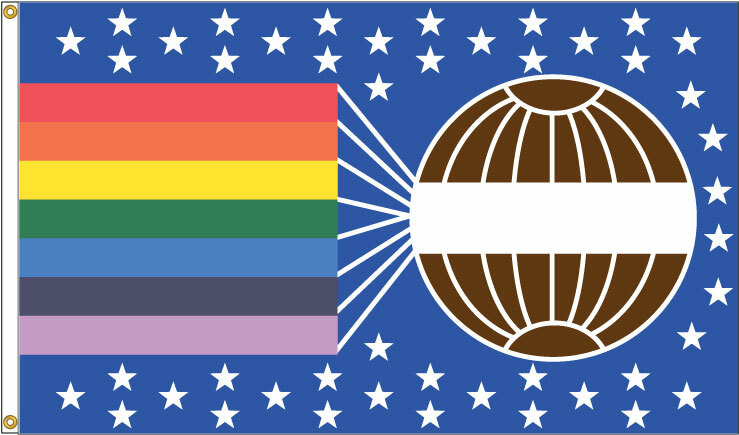 "James William van Kirk, a minister from Youngstown, Ohio, designed a peace flag with rainbow stripes, stars and a globe. With this flag, he twice made a peace tour through Europe. The Universal Peace Congress adopted this flag as its World Peace Flag." The flag in question is this. (An early reproduction of the World Peace Flag. Printed by Koopman, W.A.F., Den Haag). The picture caption mentions that the flag was created in December 31, 1912. Here's an image of the adopted proposal. 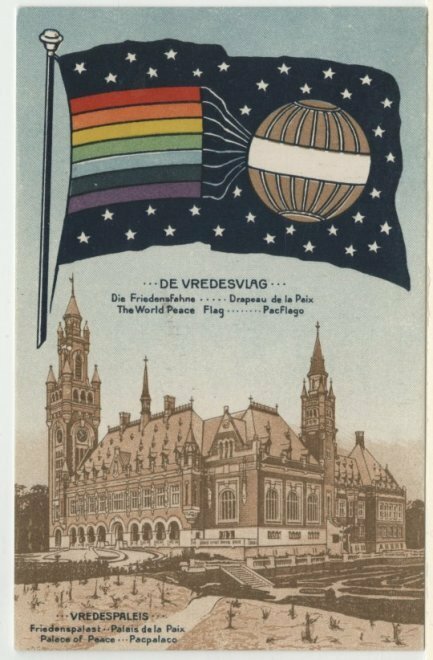 In this provided link there's a 1917 postcard with which the author promoted the flag, and there's even a photograph of the designe with the actual flag, plus additional information on the meaning of the colors, design, etc. Since this 1912 proposal flag was adopted by the XXth Universal Peace Congress in The Hague as the "World Peace Flag", then we should include it in our own "World Peace Flag".